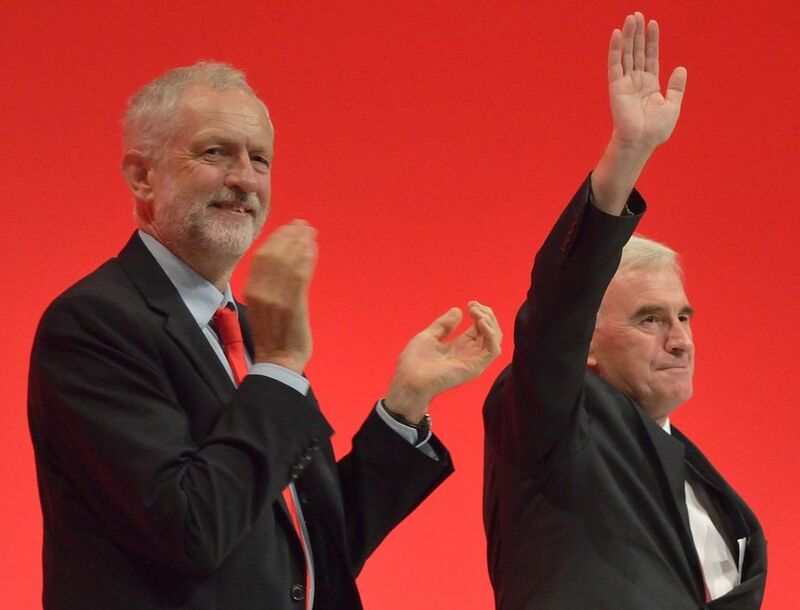 Jeremy Corbyn and John McDonnell, after McDonnell gave his Shadow Chancellor of the Exchequer speech, at the 2016 Labour Party Conference in Liverpool. Rwendland / Wikimedia. Review of Economics for the Many (Verso, 2018). Though they didn’t know it at the time, those who observed Britain’s 1979 general election and the Labour Party’s defeat were witnessing far more than a simple change of government. The Thatcherite ascendency that followed would not only reconfigure the institutions of the British state but establish — through a combination of luck, guile, and brute force — an entirely new political consensus that would consciously reshape British society in the process. By the time Labour returned to power nearly two decades later, a wholesale ideological counterrevolution was underway and its own leaders were among its most zealous partisans. Perhaps no other European country in the postwar era (with the possible exception of Russia) has experienced a comparably drastic ideological shift, and certainly no working class has suffered such bitter repression and defeat in such a short time. After 1990, much of the global left faced a period of retrenchment but Britain’s political sclerosis, and the widespread sense of defeat it engendered, was particularly acute. What the late Mark Fisher called “capitalist realism” — the pervasive sense that “capitalism is not only the only viable political and economic system, but also that it is now impossible even to imagine a coherent alternative to it” — reigned supreme, simultaneously afflicting the Left and animating partisans of the new order. Henceforth, “progress” was to imply only an ever-more dizzying advance into a global capitalist modernity from which no escape was conceivable and “conservatism” was anything that even momentarily stood in the way. As a consequence, parliamentary socialists — those who survived — were forced to assume an increasingly defensive posture in a (sometimes futile) effort to preserve welfarist institutions or at very least mitigate damage. Within the Labour Party itself, the initially promising leadership of Ed Miliband ended in disappointment and defeat. Outside the electoral sphere (with a few exceptions) the Left grew more abstract in its analysis of power and less programmatic in its prescriptions for confronting or reconfiguring it. While individual causes and struggles like the anti–Iraq War movement and the 2010 student protests inspired heroic activism, its overall position was nothing short of dire and the malaise ran deep. As many socialists immediately understood, therefore, Jeremy Corbyn’s surprise 2015 election as leader of the Labour Party opened up horizons of political possibility previously unimaginable. Gone would be the former leadership’s triangulating positions on austerity, immigration, and welfare policy and back on the table were familiar social-democratic objectives around taxation, redistribution, and public ownership. But as the party’s left celebrated a stunning turn of events amidst historically weak fortunes, critics of Corbynism overwhelmingly saw something primitive and atavistic at work. “A return to the 1970s” quickly became a favorite theme of Britain’s right-leaning press, which cast Labour’s new leadership as both a pre-Blairite and pre-Thatcherite throwback: the desiccated corpse of the “Old Labour” anachronism born anew. Even after the party’s success in the 2017 general election, versions of the narrative have persisted, as has likeminded opposition from the “modernizers” on its now diminished right flank. Much in this genre of analysis can undoubtedly be put down to poor historical memory, political opportunism, or simple bad faith. But its ubiquitousness, particularly in commentary on the center and center-left, is evidence of how just deeply the dogmas of the 1990s — and the conservative modes of thinking they reflect — ultimately run. If the Labour Party’s 2017 election manifesto emphasized somewhat familiar (though nevertheless bold) themes like nationalization and redistribution, its next one promises to be considerably more expansive — encompassing, among other things, different forms of public ownership and industrial democracy. Radical thinking of this kind has only grown more urgent. By virtually any imaginable standard — even those its adherents have set themselves — Britain’s ruling economic consensus has been a failure. Austerity has not, as successive Tory chancellors have insisted with such fanatical certitude, delivered the promised economic recovery. The legacy of the Conservative government’s deflationary fiscal policies can instead be seen in human costs that can only be called catastrophic: stagnant wages, dire and rising levels of poverty among both children and adults, crumbling public services, and a corroded social fabric alongside an ever more gilded existence for Britain’s economic and cultural elite. The underlying problems, of course, predate both austerity and the 2008 crash. A bloated financial sector with its talons deep in the Treasury has produced lopsided and regionalized growth heavily favoring metropolitan London and largely servicing unsustainable consumption at home and environmentally destructive extraction abroad. Precarity and high levels of household debt for ordinary families, meanwhile, have followed an overall shift from the older manufacturing economy to one structured heavily around services and global finance. Economics for the Many — a new collection of essays edited by Labour’s shadow chancellor John McDonnell — is simultaneously an intervention into these realities and a programmatic sketch of radical left thinking for the twenty-first century. As its title suggests, the book is also an effort to reclaim economics for the Left, an easily stated though admittedly daunting task amid neoliberalism’s persistence as the economic lingua franca. Simultaneously localist and internationalist in scope — and encompassing everything from trade, the environment, and alternative models of firm ownership to fiscal policy and the challenges posed by platform monopolies and the data economy — the essays are accessible and minimally abstract, both in their concern with the practicalities of policy and their awareness of the difficulties of implementation in the face of political constraints. This, however, makes them no less innovative. In chapters on democratic alternatives to private enterprise, for example, Rob Calvert Jump, Joe Guinan, and Thomas M. Hanna explore cooperatives, community-based systems of ownership, social entrepreneurship, and workplace democracy, their analyses including case studies from across Europe, North America, and within the UK. Building on Labour’s 2017 manifesto, which promised to make workers the first potential buyer should a company go on sale, Guinan and Hanna propose active investment by local authorities in the cooperative sector. In a richly researched chapter on taxation, Prem Sikka observes that the global rules governing corporate taxation date from the colonial era and considers the various ways they could be reformed to crack down on the epidemic of avoidance by plutocrats and big businesses alike. Essays by Nick Srnicek and Francesca Bria explore how platform monopolies like Google extract value from users to generate private profit and endanger individual privacy in the process, ultimately making the case for social ownership and the treatment of such platforms as public utilities. Antonia Jennings and J. Christopher Procter, meanwhile, grapple with the dominance of neoclassical orthodoxy in the study of economics and set as an urgent task for the Left the democratization of economics discourse itself. Localism and decentralization figure prominently throughout the collection, both as potential correctives to the UK’s own lopsided distribution of wealth and necessary checks on the power of global capital. The contribution from Grace Blakeley and Luke Raikes, for example, forcefully argues for devolution of various fiscal prerogatives from the central state to regional authorities while another chapter explores how Preston City Council has successfully employed locally based economic and investment strategies as an alternative to bureaucratic state management. If a single theme unites the book’s various essays it is, simply stated, a belief in democracy as a moral but also a practical necessity. While neoliberal intellectuals of the late 1970s and 1980s championed the market as the crucial sphere of individual freedom and expression over and against the state, the success of their project has largely come at the expense of all but a privileged few. Vast concentrations of wealth, it turns out, do not empower ordinary people or allow a “property-owning democracy” to flourish and, far from even rolling back the state, simply capture and configure it to promote their own narrow, often destructive, interests. Amid a global consensus that continues to champion this flawed model, the contributions found in Economics for the Many forcefully make the case that the solution lies neither in an intensified neoliberal capitalism or a bureaucratized state, but in the sweeping application of democratic principles to our economic thinking, activities, and institutions themselves. The transformative course sketched in Economics for the Many channels the growing confidence and determination of the Labour Party’s now-dominant left heading into an undoubtedly decisive forthcoming general election. But it also distinguishes itself in showing how real, dynamic, practical alternatives to dominant economic thinking can be imagined and promoted in a world where global capitalism and its orthodoxies still reign supreme. In this way, it stands out as a particularly potent repudiation of the once-dominant Blairite vision of progress and the dispiriting ethos of capitalist realism it exemplified. Insofar as the thinking of today’s Labour left does reflect the “return to the 1970s” its critics like to charge, it is the 1970s of labor militancy, radical shop stewards, and the industrial democracy once imagined by Tony Benn as a means of modernizing Britain’s increasingly imperiled Keynesian welfare state. We are seeking nothing less than to build a society that is radically fairer, more democratic, and more sustainable in which the wealth of society is shared by all. The old, Morrisonian model of nationalization centralized too much power in a few hands in Whitehall. It had much in common with the new model of multinational corporations, in which power is centralized in a few hands in Silicon Valley, or the City of London. It won’t work in a world in which technological change is providing opportunities to decentralize power. We cannot turn the clock back to 1945 either. Whatever its challenges, this is a Left both steeped in classical socialist values and consciously concerned with the practical problems faced by modern economies and the ordinary people who inhabit them: the worsening climate crisis, the tyranny of multinational firms, the global epidemic of tax avoidance; the advent of new surveillance and information technologies and the more menacing forms of exploitation and monopoly they have enabled. While the future of Labour’s right and the ossified consensus it still champions remains uncertain, and the Conservative Party reels through the chaos of Brexit negotiations, the Labour left is discovering a coherence and a sense of militant purpose that might be called “socialist realism.” It is neither the utopianism of the early and mid-twentieth century nor the more austere capitalist realism of the Blairites who, in the 1990s, identified the path of least resistance and sold it as a bold and revolutionary, though ultimately inevitable, course. Instead, it is the realism of a left that has quite suddenly emerged from an unfathomably disadvantaged position and found itself in one of radical possibility; of a left once again capable of imagining real alternatives to capitalism; and of a left which understands something its critics still invariably fail to grasp: that amid impending environmental disaster, crippling global poverty, and rising authoritarianism and oligarchy, neoliberalism has been a monumental disaster which hollows out our present while imperiling our future. If we are to hope for better, envisioning and realizing a democratic, socialist society is our most urgent task. As the familiar expression goes, there is no alternative.